It may sometimes appear as though RStudio has lost its rightmost two panes (for instance, you can see the Script and Console panes, but not the Environment or Plot pane). The cause of this problem is usually that the right panes have been minimized. They can be restored by dragging the gripper that separates the right panes from left panes. The gripper can be found halfway down the window, along the right edge. The problem is somehow associated with the project I'm working in. If I quit the project, the "gripper" returns, but if I reopen the project, the upper-left pane expands (animated) to occupy the whole window. I can get upper and lower panes with the button in the upper-right, but I can't get left and right panes. The issue was with zooming to single panes. This is fixed In the View -> Panes menu, or ctrl-shift-0 to zoom to all panes. This issue is preposterously frustrating. The grabber disappeared for me as well. View -> Panes was the solution - thanks Michael. 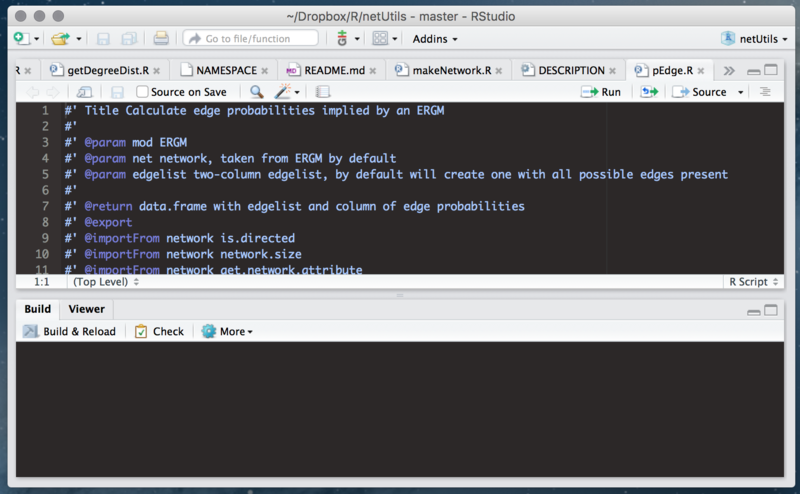 I have just installed RStudio. I have no environment tab, and there is no View menu from which to select Panes. Also no gripper. This is on a Mac. I seem to have the same error as the previous post. I am running version 3.4.2 but cannot see or open an environment window. Looked through every menu option but nothing seems to solve this problem. Missing gripper and cannot perform any of the "show" functions under the View tab.